Mormon Mommy Writers and Friends: A question that might change the rest of your day. A question that might change the rest of your day. 1. I spent some time with some amazing homeless women. 2. A neighbor down the street committed suicide. 3. A dear brother in our ward passed away from cancer, leaving behind a wife and teenage children. Whenever I see people suffering, I can't help but think, That could be me. What I didn't have extended family, if I didn't have the church, if I didn't have my husband? Could I be homeless like those brave women? What if someone I love and care about took their own life? Could my life be torn apart by the grief and guilt? What if 10 years down the road my husband gets cancer and passes away? Could I be the heartbroken widow with four kids? The first time I saw this was probably at least a year ago, but it is something that has stuck with me. Yet it was never really troubling to me because my prayers are full of gratitude. I try to always tell God how thankful I am for what He's given me. 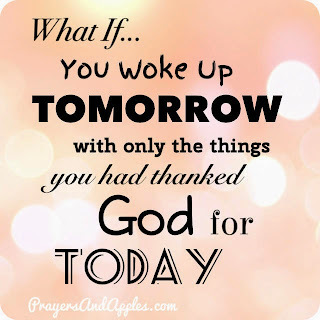 But then I wondered- do I try to always show God how thankful I am for what He's given me? Part of what sparked that question was this post by Jason F. Wright about Mothers Day. He said, "What good is it to spend $20 billion on Mother's Day and drop our dirty clothes on the floor Monday morning?" His point was that gratitude is about more than just flowery words- it's about action. Would it be obvious to someone looking in on your life from the outside that you cherish your children? Or would they assume that what you truly cherish is your smartphone? Would it be obvious that you cherish your husband? Or does it seem to matter more that he left his dirty socks on the floor again? What about the gospel? Would it be clear that your testimony of the gospel is something you can't live without? Does it receive enough of your attention that it's apparent it's one of your cherished possessions? And because we're writers- what about your writing talent? Could someone peek into your life and see how you cherish that talent by the way you use it? Today in our Relief Society lesson, I read what President Kimball said about the scriptures: "The Lord is not trifling with us when he gives us these things, for 'unto whomsoever much is given, of him shall much be required.' (Luke 12:48) Access to these things means responsibility for them." The Lord is not trifling with us when He gives us our families- access to our family means responsibility for them. The Lord is not trifling with us when He gives us our talents- access to our talents means responsibility for them. So today, I would ask you to take a close look at your life, at the way you spend your time- are you doing more than just telling God thank you? Are you showing Him with your actions that you cherish these gifts? Wow, that is incredibly poignant. It gives me a lot to think (and pray) about. Great badges, both of them. It's so easy to take God's gifts for granted. I think God for his mercy.